Limited seating. To reserve your place, register here. Allison Bell is co-author of two field guides to the alpine areas in New York and New England. Maida Goodwin worked for many years as an archivist at Smith College’s Special Collections. After their talk, Bell and Goodwin will be on-hand to sign their new book, Glorious Mountain Days: The 1902 Hike that Helped Save the White Mountains. The book includes the letters, historic photographs and Bell’s gorgeous modern-day images of the flora and fauna of the Whites. 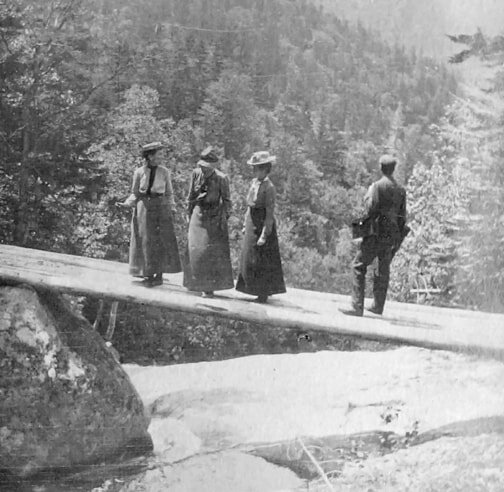 For a week in July 1902 amateur naturalists Hattie Freeman and Emma Cummings hiked with legendary trail builder J. Rayner Edmands, two other companions, and a guide across New Hampshire’s Presidential Range. Both were early members of the Berkshire Appalachian Mountain Club and the White Mountains were a favorite destination. Freeman, meanwhile, also had strong ties to Northampton. During their 7-day hike, Hattie took dozens of photographs and both she and Emma wrote letters to a mutual friend—the well-known Reverend Edward Everett Hale—describing the mountain birds, alpine flowers, rugged trails, and camp life. But all was not idyllic. Aside from the black flies, as they tramped across the mountains, they saw first hand the impact of extensive forest cutting as well as new development threats to the Range. Upon their return, the two women helped lead a passionate and savvy political campaign, which ultimately resulted in the establishment of the White Mountain National Forest. This once-forgotten adventure story was rediscovered thanks to three separate, but overlapping research projects that included work at The Library of Congress in Washington, DC; Smith College’s Special Collections and photographs, which had been preserved by the Freeman/Rankin family in Massachusetts; and the Lowe family in the tiny town of Randolph, NH. How these letters and photographs were re-united after more than a century is a story in itself and a model for researchers and historians. That story, along with the letters and photographs, are all included in Glorious Mountain Days, a new book by naturalist Allison Bell and archivist Maida Goodwin. “It’s inspiration for anyone interested in local history, women’s history and for any environmental advocate looking for a model of success,” said Allison Bell, a 35-year resident of Northampton, who recently moved to Whately. Co-sponsored by Berkshire ​Appalachian Mountain Club. of the Presidential and Carter Ranges in July 1902.